Most developers are afraid to start using CSS Grid because of browser support, but CSS grid is fully supported in all main browsers: Chrome, Firefox, Safari, Edge including their mobile versions. The problem we still have, is supporting IE (Internet explorer). 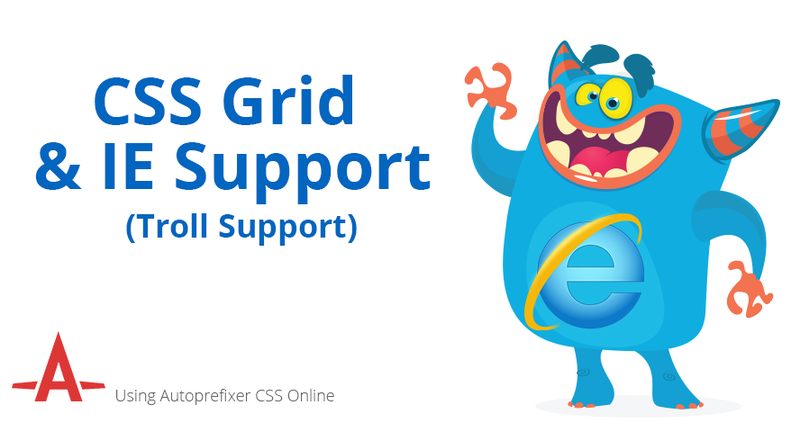 What you might not know, is that CSS Grid was first supported in IE 10. In this post I will teach you how to support CSS Grid in IE 10 and above, while using the old CSS Grid syntax, without the need to know the old prefixes of IE CSS Grid. What isn't supported in CSS Grid in IE, and How can you Make It Work? Grid-gap isn’t supported, but you can use CSS margin instead. Grid-template-areas isn't supported, but we can convert it to work with grid lines. Important: the HTML <main> tag doesn’t work with CSS grid. Replace it with <section role=”main”>. Let’s take these CSS Grid styles that aren’t supported in IE. Autoprefixer is a postcss tool that reads your CSS, and either adds or removes prefixes, according to a predefined list of supported browsers. They also have an online tool you can use to add prefixes to your snippets. Now we will copy the code, as it is, to Autoprefixer CSS online. Notice! when converting grid-template-areas, you have to also convert grid-area along with it, because autoprefixer needs to know the connections between them. We got CSS that is 100% IE CSS Grid compatible. You don’t need to understand the IE syntax, the converting is doing a great job! I hope you’ve enjoyed this short post and learned from my experience.